At Alexandra Locksmiths we have just supplied and installed a 16mm round security bar gate over the front door of a flat for a customer in Stratford, East London, E14. 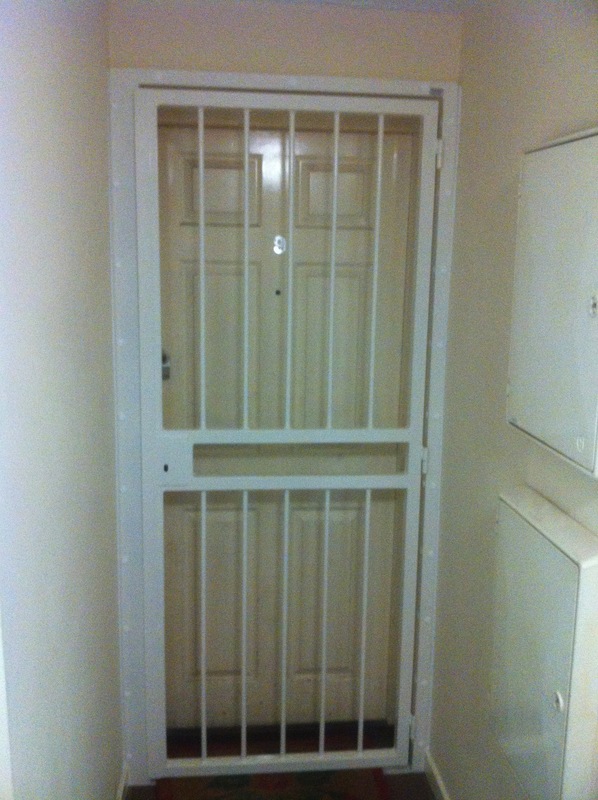 The security door gate is fitted with a Chubb 5 lever BS3621 British Standard deadlock and can not only be locked from the outside when leaving the property, but also from the inside, giving the lady the peace of mind of opening her wooden flat front door and seeing who is there, knowing she is protected from someone pushing past her. The customer was concerned about her security as the other flats on the same floor all had alarms and extra locks, making her the easiest option for a would be burglar, not only that prior to installation there was a situation with someone found sleeping in the communal hallway. She now feels totally secure when at home and work. Below is a picture and a testimonial that the customer emailed to me soon after the job was completed. “I have used Alexandra Locksmiths to install a bar grill outside my door in a block of flats. From the start, Master Locksmith Paul Byrne was most professional and had a good knowledge of all his products and was able to advise accordingly. He was able to do a quote for me and was honest and transparent with his prices. I found the service very professional and the product is of good quality. Please click the link below for more information on bar gates, collapsable grilles, fixed bar grilles and diamond mesh grilles.